For people that have had their leg in a plaster before, they know one of the greatest challenges is wearing any shoe that fits the plastered leg. 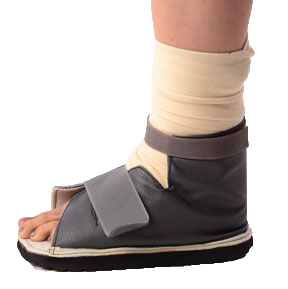 Vissco brings you cast shoes, which are made for that very same purpose. They provide firmness and orthopaedic support to the ankle. They prevent the plaster from chipping, cracking or soiling and facilitate stability while walking. The enhanced rocker bottom permits a more natural gait and the rocker sole too is slip resistant. A must have for people with a plastered leg.